“Here’s An Easy Way to Make Cauliflower Taste Amazing” is available via audio. Click below to listen. 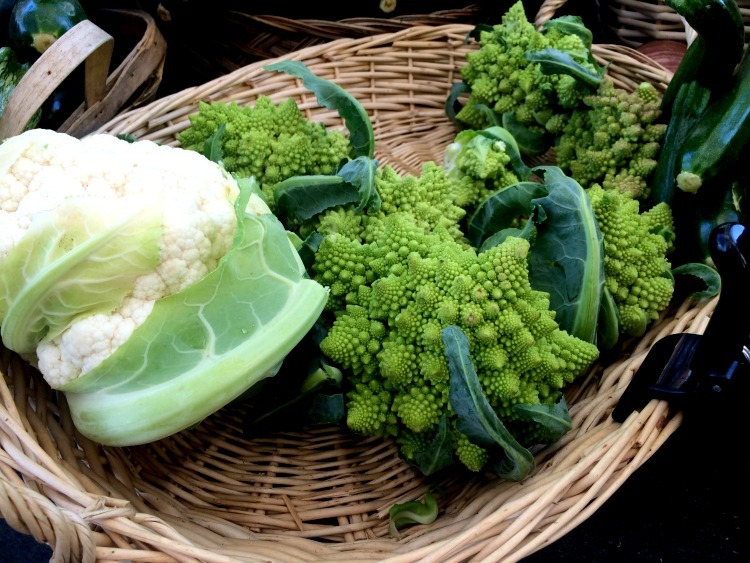 Maybe you can relate… For most of my life, I had zero interest in cauliflower. 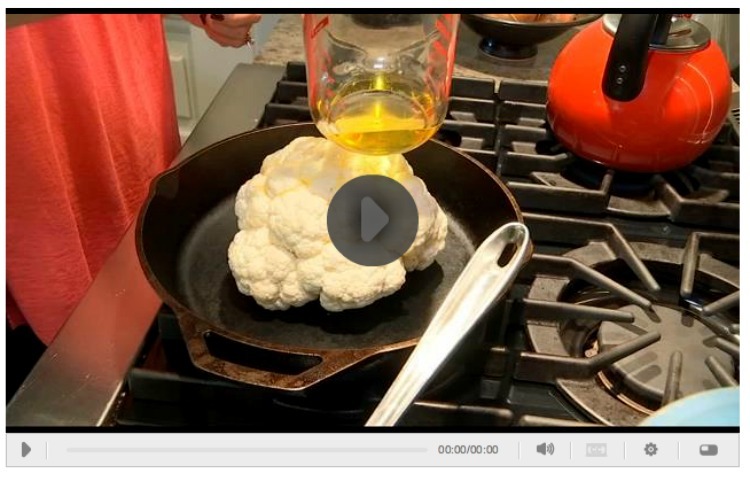 As in: steamed cauliflower on a plate? No thank you. Raw, and with dip? Forget it. Fried? Maybe. Although I think I’d just about anything fried, especially if truffle salt’s involved. For decades, I found cauliflower completely unappealing: bland, boring, a bit stinky — and, when raw, difficult to digest. And by the way, kind of a hassle to deal with — that whole business about separating the florets and all. Well this all changed when I read Molly Wizenberg’s charming food memoir, A Homemade Life. In the book, Wizenberg talks about how she had been roasting cauliflower for years, but never thought about serving it with a dressing until her friend introduced her to a roasted cauliflower with salsa verde. That bland, boring, subtly stinky, and hassle-to-deal-with vegetable I’d been ignoring for years? Was it really possible it could taste that good? I was skeptical, but I was loving Molly’s book, and trusted her palate. So I tried the recipe, and believe me, it delivered. The cauliflower was crispy on the outside, tender on the inside. It tasted like… french fries. And the salsa verde? Double-swoon. Nowadays, cauliflower makes regular appearances on my plate. My family and I enjoy it roasted, of course, as well as mashed, “riced,” and in my Curried Cauliflower Soup. And even in this Chocolate Surprise Smoothie. 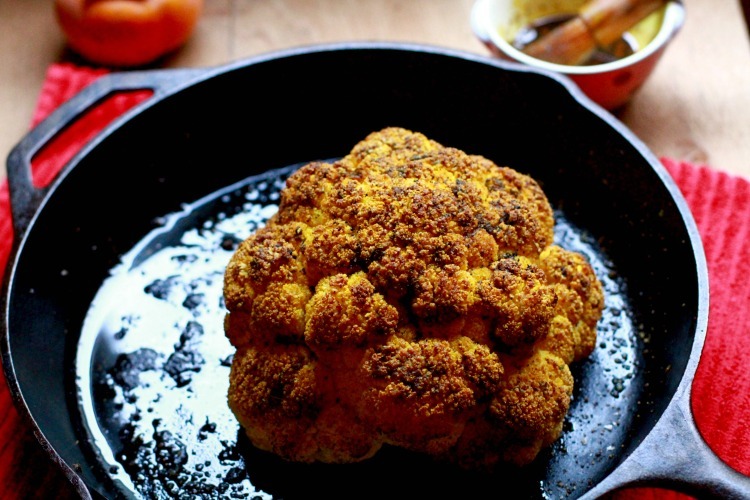 Of course, finding cauliflower recipes you like is great. But it’s even better when you know specifically why it’s so good for you, and how it can strengthen your immune system and reduce risk for disease. First, cauliflower is low in calories and carbs. I’m not a big calorie or carb counter, but I recognize that many people are, especially if they’re following a Whole 30, Paleo, or low carb diet. The great thing about cauliflower is that it’s also high in fiber — so it’ll help you feel full for longer. That’s why cauliflower is a great alternative to mashed potatoes, or in soup. Cauliflower is also high in vitamin C, which is one of the most important antioxidants for reducing inflammation, and boosting immune system function. In other words, vitamin C plays an important role in keeping us strong against infection, harmful bacteria, and cold-and-flu season. Here’s another cool fact: cauliflower is high in vitamin K. This nutrient isn’t a household name like vitamin C, but it’s super important for maintaining bone health and reducing risk for osteoporosis. People who take antibiotics or cholesterol-lowering drugs like statins are especially vulnerable to vitamin K deficiency. Another great reason to get more cauliflower into your diet. As if reducing cancer risk and being heart-healthy and supporting healthy bones wasn’t enough… there’s more! Cauliflower contains antioxidants that help balance hormones, as well as compounds that support eye health. And, it can be helpful for thyroid balancing. Cauliflower also comes in a tidy package that includes fiber, folate and vitamin C — all of which work to provide a protective effect against uric acid build-up and gout. So now that you know just how amazing cauliflower is for you, let’s talk about how to make it taste amazing. This Spicy Whole Roasted Cauliflower is an age-old — and currently trendy — preparation that involves roasting the cauliflower whole until nearly tender, and then roasting it for an additional period of time after basting it with a spicy mixture to add flavor, and produce a rich, brown crust. Make it for Thanksgiving — or a holiday function — for an impressive presentation and delicious flavors. The cauliflower should be tender and fully cooked on the inside, with a pleasing savory crust on the outside. I’m not going to lie: this recipe is simple, but it takes some legit oven time — about 90 minutes, depending on the size of your cauliflower. So you’ll definitely want to make this when you’ll be around the house for awhile. Side note: you may notice a fair amount of oil (or ghee) in this recipe. If you’re in detox or cleanse mode, you might be better off with my Creamy Tomato Soup or Beet and Arugula Salad. This recipe is more indulgent than most, and certainly wonderful to enjoy occasionally — especially when you’re entertaining or making dinner for someone special. The most complicated part of this recipe is measuring out all of the spices. It only takes a few minutes, but I know that can be overwhelming when you look at a recipe and see 10+ ingredients. So just know that it goes quickly once you’ve purchased or organized all of the spices. Day 1: Make the spice blend on one day, and store in a lidded jar. Day 2: De-stem and rinse the cauliflower, and store in fridge. Day 3: Make the sauce, roast the cauliflower and serve. Tuck it into a wrap or lettuce leaf with hummus, fresh parsley, and pickled red onion or pepperoncini. Blend it with a can of garbanzo beans, tahini, olive oil and lemon for a roasted cauliflower hummus. Heat up some broth, throw in the leftover cauliflower, and blend for a quick soup. Store extra sauce in the fridge. Then gently heat and drizzle over roasted vegetables. 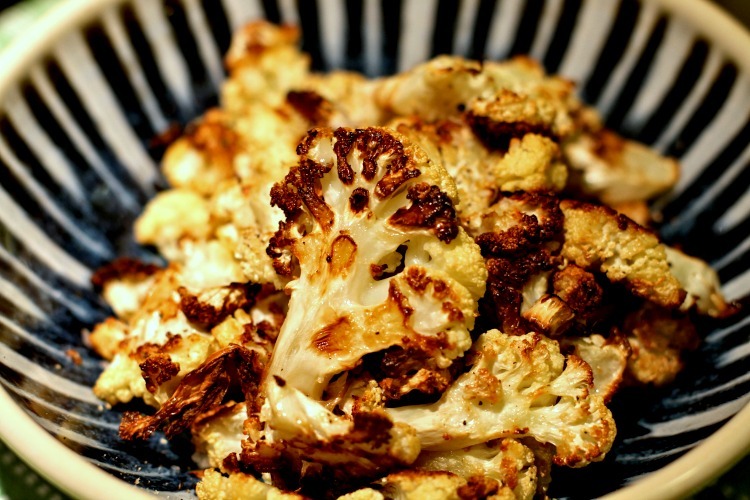 Spicy Whole Roasted Cauliflower is quite rich, so it does very well paired with bright, fresh flavors. Fresh, bitter salad greens, such as baby arugula, with my super simple 5-Second Salad Dressing. Your vegetarian and vegan friends. For the vegan version, use melted coconut oil instead of ghee. Gluten-free friends. This recipe actually has its roots in Polish-style cauliflower served with a bread crumb and butter sauce. To make it allergy-friendly, I omitted the gluten and added spices for flavor. Dairy-free friends. Ghee is butter without the milk solids, so it’s usually lactose and casein free. However, if you want to go completely dairy-free, use coconut oil instead of ghee. An “appetizer” of mindfulness and some slow, deep breaths: inhale to the count of 4, hold for 5 counts, and then exhale for 6. Repeat a few times, get grounded, and savor every bite. Now that you know how powerful cauliflower can be — and how to make it taste delicious — plan on making it as a Thanksgiving side or for an upcoming dinner party. It would even be fun as a potluck dish. The Spicy Whole Roasted Cauliflower is a perfect option for when you’re trying to live a healthier holiday season. Which isn’t easy to do, by the way. But it’s easier when you have some delicious vegetable and plant-based recipes at your disposal. 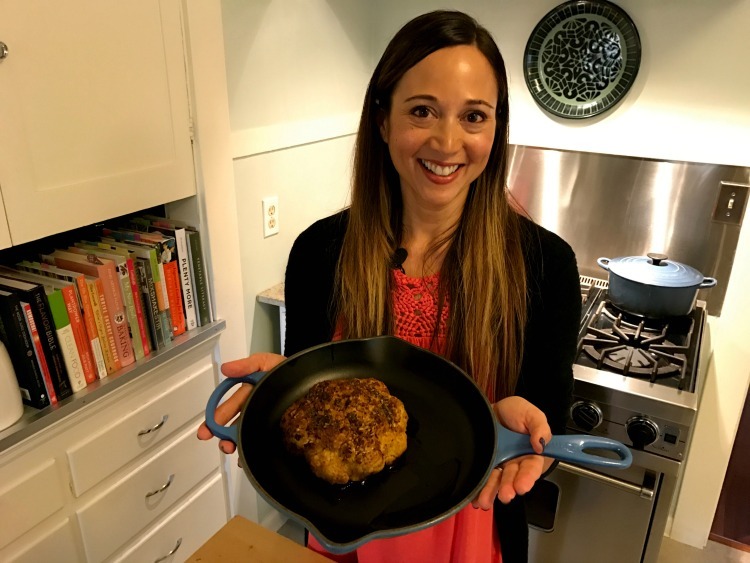 I prepared this Spicy Whole Roasted Cauliflower during one of my healthy eating segments on More Good Day Oregon. Click below to watch me make the dish, step-by-step. Ready to get this beauty onto your table? Great! Just click on the green box below. If you make the recipe, please let me know how it goes. Just tag @mospo on Instagram. I’d love to see your kitchen creations!